Nov. 9, 2018 6:45 p.m. Ask John Cullen a question, and you’re bound to get a thoughtful, usually funny – and sometimes lengthy – answer. A few times during a near-hour long conversation, the 33-year-old Semiahmoo Secondary graduate stops himself, and caps a thought with something of an apology. But one question posed to him triggers an answer that is much more concise: Is Cullen – a man who holds many jobs – the best curling comedian, or the funniest curler? “All of those,” he laughed. “There are a lot of really funny curlers actually, but professionally funny, I’m the best. And I am certainly the best curling comedian, there’s no doubt about that. I’ll take anyone on. Most comedians are in horrific shape, so I can beat most of them in a sprint, we don’t even have to get the curling rocks. Oh right, there’s that, too. Cullen, who now lives in Vancouver, has been a high-school teacher-on-call in the Surrey school district for a decade – a full-time gig wouldn’t mesh with his comedy and curling pursuits – and he has been curling for twice as long. He first picked up the sport in Ontario, where he grew up, and upon moving to the Semiahmoo Peninsula in 1999, joined the youth program at Peace Arch Curling Club, before moving up to the junior and men’s ranks at New Westminster’s Royal City Curling Club. He picked up comedy on something of whim one summer when he was looking for something to fill time before school started up again in September. Inspired by his uncle, Canadian comedian Chris Quigley, Cullen started scribbling down random jokes, observations and thoughts, and at the end of that summer, decided to take his new material on stage at Vancouver’s Comedy Mix, which was hosting an open-mic amateur night, with rookies sandwiched between well-known comedians Erica Sigurdson and Ivan Decker. “Summers were super boring so I just started writing jokes,” Cullen said. “It got to the point where I’d written so much down I figured, ‘Well, I might as well try this.’ I legitimately thought I’d be terrible and never do it again, and it would just be a funny story. I’d just walk off stage, say ‘see ya later’ and go back to teaching. His experience as a teacher helped him “cheat the system a bit” since he was already used to speaking to an audience – often an inattentive one. “Doing comedy is speaking in a room full of people who want you to do well. They’ve paid for a night out, they have a babysitter, they want you to be good,” he said. From that first open-mic show, he continued to perform, eventually getting signed as a regular at Yuk Yuks in Vancouver. He’s since performed at Just for Laughs, been a guest on CBC’s The Debaters, and toured regularly during the summer – the offseason for both teaching and curling. Last month, he also performed in Langley as part of the Fraser Valley Comedy Festival. On the curling front, Cullen and his teammates – Jay Wakefield and Sebastien Robillard, both of Maple Ridge, and Calgary’s Josh Barry – are among Canada’s top men’s teams, and are currently ranked in the top 50 in the world. They are frequent participants at men’s provincials, and should they qualify again this year, it will be Cullen’s ninth attempt at a B.C. title. And if his schedule wasn’t busy enough, Cullen has also become a man of many podcasts. He recently wrapped a three-and-a-half year run on Real Good Show – a popular sports/comedy show he co-hosted with Justin Morissette Stefan Heck – and is in the midst of the first season of his own solo endeavour, Stone and Straw, a curling podcast in which he interviews some of Canada’s most well-known curlers, from Olympian John Morris to Cheryl Bernard. “Oh god, I don’t even talk about podcasting. There’s still so many people who don’t even know what that is,” he said. “That’s a five-minute answer from me, before I even explain my part in it. “I tell this joke in my act, but I tell people I’m a teacher because everyone knows what a teacher is, and you don’t have to explain it. Because I think deep down, nobody wants to talk about their job. “Having a career in sports or entertainment, it’s almost impossible not to sound conceited when you talk about it. Stone and Straw is a one-on-one interview format – a far cry from the often-bizarre, always-profane back-and-forth of Real Good Show – that Cullen has high hopes for. A few months into the podcast’s first season, the response he’s got from curlers and others in the industry has been positive, he said. The informal sit-down interviews are each recorded in person – Cullen spent part of the summer travelling from Sooke to Alberta to talk with his guests – and he hopes they become a place where curlers can let their guard down a little bit, and enjoy in-depth questions they aren’t used to being asked during traditional quick-hit television interviews. In fact, Cullen – who has also hosted online curling Q&A shows in the past, for both Curling Canada and popular website Curling Zone – hopes his show helps transform the way the sport is broadcast and delivered to fans. “There’s such a dearth of curling media, and the ones who are doing it are very old, which is fine, but curling has a real identity crisis right now. There’s the baby boomers who loved curling growing up… but that generation, sorry to put it bluntly, is either dying or losing interest,” he said. “I personally like the way it’s broadcast because I’m as much a fan as I am a player, but the way it’s shown now is in no way geared towards garnering new fans. If Stone and Straw continues to grow, Cullen said he would one day love to expand into traditional radio or even television work. Which, of course, would add yet another job to Cullen’s already too-busy schedule. “I’m challenging how many things one person can do,” he laughed. Perhaps then one of his fellow comedians will be able to catch him in that sprint. 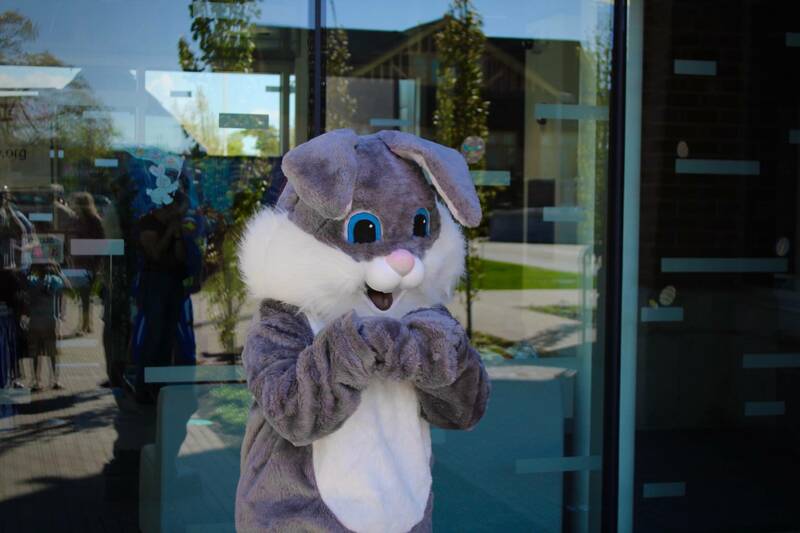 Children had a chance to meet with Easter reptiles, falcons, owls and of course, bunnies.